OSHA issued a final rule that sets November 10, 2018, as the date employers in the construction industry must comply with a requirement for crane operator certification. The final rule became effective on November 9, 2017. After issuing the final cranes and derricks rule in August 2010, stakeholders expressed concerns regarding the rule’s certification requirements. In response, the agency published a separate final rule in September 2014, extending by three years the crane operator certification and competency requirements. The additional one-year extension provides more time for OSHA to complete a rulemaking to address stakeholder concerns related to the Cranes and Derricks in Construction standard. Read the news release for more information. OSHA’s Strategic Partnership Program provides opportunities for OSHA to partner with employers, workers, professional or trade associations, labor organizations, and other interested stakeholders. Strategic Partnerships are designed to eliminate serious hazards and enhance workplace safety and health practices in major corporations, government agencies, private sector industries, and at large construction projects. OSHA’s Dallas Area Office and Whiting Turner Contracting Company signed a partnership to protect workers during the construction of a senior living high-rise complex. The goals of the partnership are to prevent work-related fatalities, reduce or eliminate serious workplace hazards, and establish an effective safety and health program. OSHA’s Corpus Christi Area Office and McCarthy Building Companies are working together through a partnership to protect workers during a multi-building healthcare construction and renovation. The agreement is to address hazards within the construction industry and to promote and recognize company jobsites that have demonstrated effective safety and health programs. The OSHA office in Dallas signed two-year Alliance agreements with foreign consulates to provide workers with guidance and access to education and training resources related to occupational safety and health, including the prevention of falls in construction. The Alliances were signed with the Consulate General of El Salvador in Dallas and the Consulate General of Mexico in Dallas. McGregor Industries Inc. operates a small business in Dunmore, Pa., that fabricates, delivers, and installs light structural and metal products for buildings, artistic projects, and anything requiring the shaping and finishing of metal. The company contacted OSHA’s On-Site Consultation Program for help improving its safety and health program. All hazards and violations identified through consultation visits were corrected, and employees were provided with more comprehensive training that included hazard identification and control. These and other improvements earned McGregor Industries acceptance into OSHA's Safety and Health Achievement Recognition Program. Since becoming a SHARP participant, the company has been free of recordable injuries, is working to find new ways of reducing injuries, and has been able to secure better insurance for individual jobsites. For more information, see the company’s success story. OSHA has resumed normal enforcement throughout parts of Florida and Georgia after temporarily suspending most programmed enforcement actions following Hurricane Irma. In the hurricane’s aftermath, OSHA provided compliance assistance and outreach to employers and workers involved in the cleanup and recovery operations in the two states. Thousands of crews and individual workers received job safety and health technical assistance. 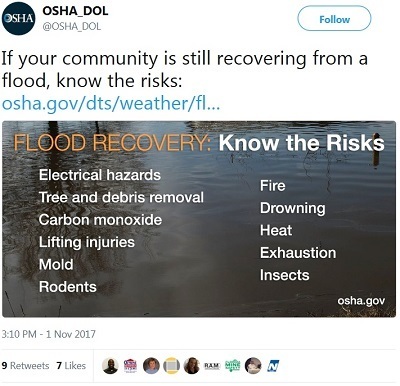 Employers and employees working in affected counties may call OSHA’s toll-free hotline at 800-321-OSHA (6742), or go online to reach agency representatives in Florida or Georgia who can provide on-site assistance. For more information, read the news release. OSHA cited Lynnway Auto Auction Inc. for electrical, struck-by, and other hazards at its auto auction facility in Billerica, Mass., after five people were struck by a sport utility vehicle and died as a result of their injuries. OSHA issued 16 citations to the company for motor vehicle hazards, blocked exit routes, and other violations. Proposed penalties total $267,081. OSHA also cited the Dover, N.H., staffing agency, PeopleReady, with one serious violation and proposed a $12,675 penalty after the company exposed temporary workers to a struck-by hazard. For more information, read the news release. Trade Fair Supermarkets has been cited for one serious and 10 repeat violations after OSHA inspectors found that the company exposed workers to safety and health hazards at three of its Queens, N.Y., locations. Inspectors found blocked exit routes and saw blades without safety guards, and a lack of eyewash stations. The company also failed to train workers, and provide safety data sheets for hazardous chemicals. Trade Fair was cited for similar violations in 2013. Proposed penalties total $505,929. See the news release for more information. OSHA cited a grain-handling cooperative in Raymond, Neb., for failing to protect workers from entrapment and engulfment hazards. OSHA issued two willful, one repeat, and four serious violations, proposed penalties of $373,911, and placed the company into the Severe Violator Enforcement Program. The company was previously cited for a similar violation at a different facility. Read the news release for more information. Elringklinger USA Inc. has been cited for exposing workers to electrical, fall, and noise hazards. OSHA inspected the Buford-based auto parts manufacturer after an employee was injured while performing maintenance on a screen print machine. In another incident, a second worker suffered an amputation of the left index finger while making an adjustment on a punch press machine. Investigations of the incidents resulted in 29 serious and three other-than-serious violations, including failing to install machine guarding, preventing unauthorized employees from performing tasks that require the control of electrical hazards, and protecting workers from excessive noise exposure. For more information, see the news release. 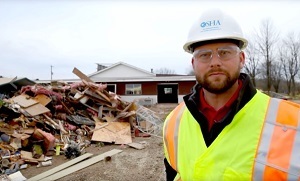 OSHA cited Knife River a Billings, Mont., general contractor and Rock Springs, Wyo., subcontractor, Coleman Construction Inc. for exposing workers to numerous safety hazards, causing an employee to suffer severe burns. The subcontractor was issued $189,762 in proposed penalties after an employee suffered third-degree burns when compressed oxygen inside an underground duct caused a fire, and for failing to report the hospitalization of the burned employee in a timely manner, in addition to other violations. OSHA also cited the general contractor and proposed penalties of $59,754 for not ensuring that safety precautions were taken at the worksite. For more information, read the news release. The Washington Division of Occupational Safety and Health (DOSH) issued $112,000 in penalties to Sierra Pacific Industries in Aberdeen for safety violations identified after a worker fell more than 17 feet to his death. Inspectors determined that the company removed a permanent guardrail and replaced it with yellow caution tape. Inspectors found that the company failed to: provide workers with fall protection equipment; guard an open-sided elevated work platform; and train workers on fall hazards. Washington DOSH issued the company one willful and six serious citations. For more information, read the news release. OSHA has released four new fact sheets on protecting workers from common hazards found in the shipyard and maritime industries. The subjects covered by the four fact sheets are pedestal crane safety, housekeeping safety, fire and rescue in shipyard employment, and safe baggage handling. OSHA provides news and commentary on workplace safety and health from its senior leadership, staff and guest contributors on the DOL blog.